Gary Barnett is back to calming nervous Israeli investors over his company’s bonds trading on the Tel Aviv Stock Exchange. Since May, when his firm Extell Development released its first-quarter financial reports, the price on the two rounds of Extell bonds have decreased between 5 and 7 percent, and are now trading at 13 percent yields. That’s an improvement over last year’s high of 16 percent, but too high for comfort for some investors. In December 2018, Barnett has to begin paying back the $360 million he raised in the first series, starting with a first payment of about $180 million. Kobi Segev, CEO of investment fund Ayalim Mutual Funds, which has over $50 million invested in Extell bonds, has called for the bondholders to meet to discuss possible steps in case Extell can’t meet its obligations. “There is a significant concern regarding the repayment of the debt,” Segev told Israeli business publication TheMarker. “We’ll take all possible steps allowed according to the terms of the bond offer,” including the possibility of a forced redemption of the bonds. The way Barnett tells it, the investors haven’t done their homework and don’t understand that development firms like Extell don’t operate like those with steady cash flows. A source familiar with the market agrees. “Extell’s problem is not the balance sheet,” he said, implying that he has enough assets to pay off the debt. Rather, Extell’s problem is their timeline, which has been slow to show results on the projects he has under development. According to first-quarter reports, Extell had not signed any contracts at the 92-unit One57 condominium, with 48 units remaining. And that has his investors on edge. Normally, developers refinance the bonds with a new issuance, and the concern among investors is that with the Extell’s bonds trading at such high yields, it could be difficult for him to do so, the source said. Barnett said the concerns are unfounded, and that he is satisfied with the pace of the projects. Segev was not immediately available for comment. 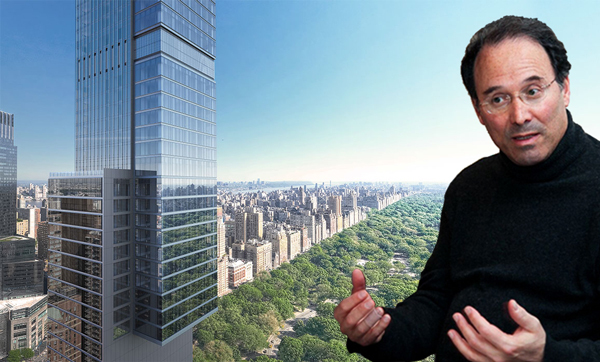 Extell’s Central Park Tower , the most expensive condo project in the city’s history at $4 billion, received state approval last month to launch sales.